Walt Disney Animation Studios returns to the Hundred Acre Wood with "Winnie the Pooh." 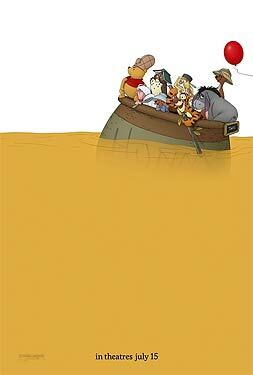 Featuring the timeless charm, wit and whimsy of the original featurettes, this all-new movie reunites audiences with the philosophical "bear of very little brain" and friends Tigger, Rabbit, Piglet, Owl, Kangs, Roo...and last, but certainly not least, Eeyore. Winnie the Pooh not only features characters parents love to share with their children, but values and simple joys of life. Inspired by three stories from A.A. Milne's books in Disney classic, hand-drawn art style, the film features the voice talents of John Cleese, who serves as the narrator along with Jim Cummings, who voices Winnie the Pooh and Tigger, Travis Oates who provides the voice of Piglet, Bud Luckey serves as the voice of Eeyore, Craig Ferguson voices Owl and Tom Kenny is the voice of Rabbit. The film is directed by Stephen Anderson and Don Hall and is executive-produced by John Lasseter.